Marble.com is the premier natural stone countertop fabricator and installer in the world. We possess a massive selection of over 2,000 colors of stone, utilize state-of-the-art templating and fabrication technology, and provide incredible customer service. Our Selection Marble.com is not only a fabricator and installer of countertops, but also a direct importer of natural stone. With over 2,000 colors, we have the largest selection of natural stone in the world. Our selection is a great advantage when it comes to helping our customers. 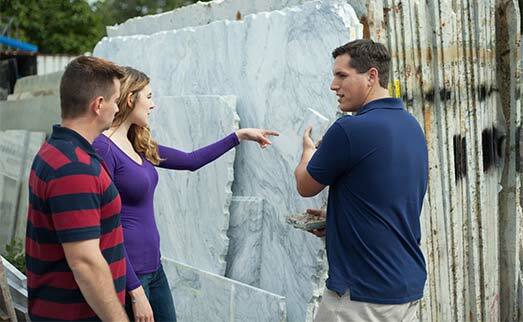 When a customer comes to visit Marble.com, they are sure to find something that will fit their needs. We import only premium quality natural stones from the most renowned quarries in the world, and have created positive working relationships with these quarries to get the best prices for our customers. Additionally, having our own stone allows us to work faster and produce our stone products within a very brief time period. Our inventory can be viewed by the public at each one of our locations, and full slabs are available for viewing. Our Marble.com facilities also have a several different kinds of stone to choose from. We have materials that are commonly used in the home, as well as some truly unique materials. Our most popular material is granite, which comes in just about any color you can imagine and a wide variety of patterns, from eye-catching, veiny patterns to subtle, consistent patterns. We also have a fantastic selection of marble stones, as our name implies. Marble’s classic beauty can be found in a variety of different colors at our stores, and customers will be sure to find the perfect piece of for their home. For those looking for an alternative stone to marble with a similar aesthetic appearance, we also have Quartzite. Quartzite is a gorgeous naturally-occurring stone that can be used in a variety of home applications. Engineered Quartz is another fantastic countertop material. This man made stone is extremely durable, and comes in high quality brands such as Caesarstone, Santa Margherita, and Quantra. Each of these brands has a unique color selection and they are available at Marble.com. If you are looking to really make a statement with a decorative piece, perhaps onyx is the stone for you. This stone is full of color and incredible patterns, and is often used in master bathrooms or home bars. Some of the other exotic stone materials that we carry include gemstone, travertine, and limestone. The best way to view and enjoy these stones is to see them in person, so we invite you to come down to one of our fantastic locations and see these wonderful materials yourself! Our Technology Our impressive stone selection is only matched by our state-of-the-art technology. At Marble.com, we utilize the most advanced templating and fabrication processes in the industry. When our staff comes to the job site to measure the space for a template, they use digital laser templating we make sure that the measurements are totally accurate. The CAD (computer-aided) drawing that is created by the Laser Templator is then sent to our fabrication shop and further refined to add necessary detail and to prepare it for each of our CNC (Computer Numerical Control) machines. These CNC machines will then process the stone based on the measurements, the intricacy of the design, and the chosen material. The first machine used is the SawJet™. This machine is a combination of a diamond-tipped bridge saw and a water jet cutter. The SawJet™ uses advanced algorithms to decide which parts of the counter top are cut with each tool. The incredible speed of the diamond blade and the ability to cut curves and holes with the water jet result in a faster, more efficient process than any other method. If the job is extremely intricate and requires the majority of the edges to be cut with water, the WaterJet™ machine is used. The edge profiling is done with Breton® CNC routers, which create the perfect edge shapes and smooth them out. After every part of the stone is perfected, it can be installed into the home. Since our stone and technology are located on-site, this process can be done quickly and easily. Service At Marble.com, we believe in providing our customers with the highest quality information and assistance so that they can make the right choice for their project. Our salespeople will answer all of your questions, provide helpful suggestions, and guide you through every step of the process. Whether you already have something in mind, or just want to browse our selection, they will help you find the stone that you desire. Though our selection of stones may seem like a lot to get through, our staff knows each of these stones extensively, and can help find that perfect slab. When it comes time to get the job done, our fabrication and installation team have the equipment and expertise it takes to get your project cut and delivered the right way every time. We at Marble.com are renowned for our incredibly quick turnaround time. We understand that having countertops and other mainstays installed quickly is important to our customers, so we make sure to make the best use of our time and their time. Our goal is to create the best work possible and have it installed as soon as possible. Our machinery and staff give us the ability to achieve this goal day after day, which allows us to complete over 20,000 projects a year.